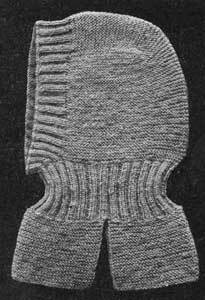 This free pattern originally published in the Woolco Knitting & Crocheting Manual, in 1916. MATERIAL-8 skeins of Woolco Knitting Worsted. 5 steel needles No. 12. Cast on 56. Knit for about 5 inches. This forms half of the cape. Repeat this for the other half. Divide the stitches on 4 needles and join as in making a stocking. Knit 2, purl 2, for 4 inches. This forms the neck. For the open face, leave 28 stitches in the middle of the front cape. The remainder of the stitches (84) knit, same as in the cape, for 90 rows (45 ridges).